BoomBoom Prints is excited to announce its collaboration with five new lines of designs, sass&peril, It’ll Glow on You, Marymake, The Little Narwhal, and We Think Small. To kick off the new lines, we sat down and chatted with one of our featured artists, Shannon Kennedy, the founder and creative hand behind the playful artwork at sass&peril. 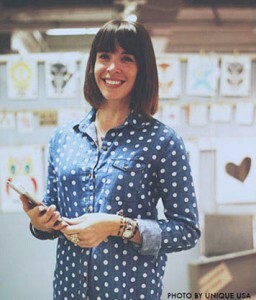 Shannon collected nearly a decade of experience working as a graphic designer before branching out on her own and creating sass&peril, a creative studio specializing in hand-crafted goods including screen printed paper and textiles. 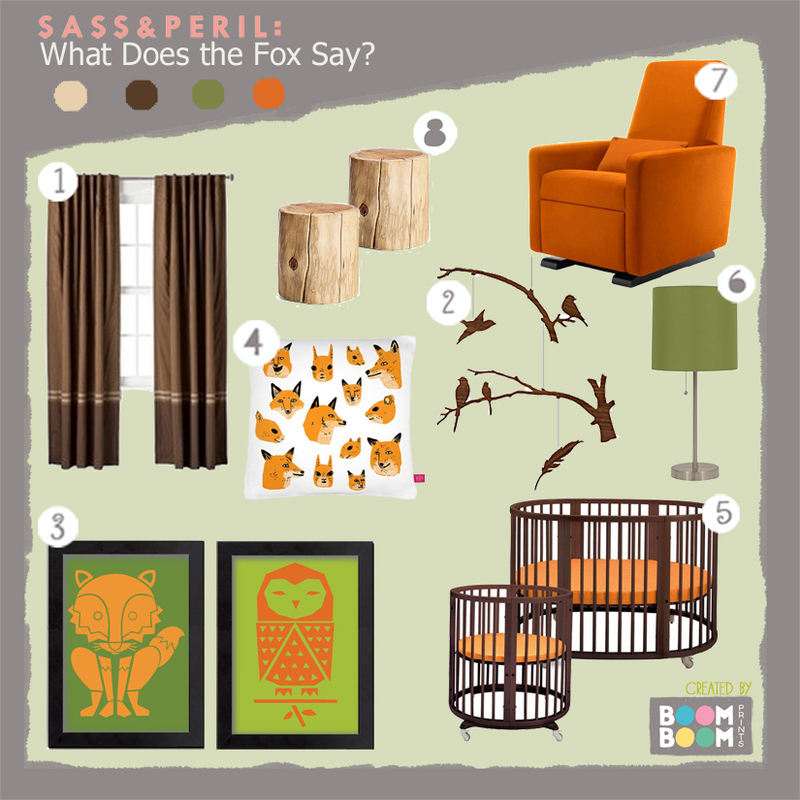 sass&peril designs are heavily influenced by mid-century and Scandinavian styling, great for both kids and kids at heart. We asked her a few questions about her exciting life as a graphic designer- take a look at what she has to say! BBP:You’ve designed apparel for major labels such as Pacific Sunwear and Vans, both known for their exciting, edgy, and creative style. What influenced you to start your own venture sass&peril? SK: I’ve always been drawn to playful motifs in design. I wanted to explore a more whimsical style combining animals and vintage design elements so I began my animals series and it all just sort of took off from there! BBP: It seems your designs are just as playful as the name of your line! Speaking of which, where exactly did the name sass&peril from? SK: Initially it was a design alias I created in college when we were working on our senior project, which was a portfolio site. I didn’t want to just use my name so I created “sass&peril”. Nowadays it reflects the kid-friendly nature of my work and conjures up personalities of the little ones that my products are purchased for. BBP: If you had to describe your artwork in five words or less, what would you say? SK: Modern with a playful twist! BBP: And the combination seems to work really well together! As far as that creative thought process goes, what sorts of things do you use as inspiration when you’re creating a new design? SK: Vintage sources such as children’s books, home decor, and accessories. I also look to see which colors and design motifs are trending and if I can work those into my pieces. BBP: What do you think is the coolest thing about working in such a creative field? SK: Getting to do what I love and what comes naturally to me as a living! It is also a very laid-back and casual industry so the rules are more relaxed and designers can afford a higher level of autonomy. BBP: Is the art industry always something you saw yourself in or did you have a different childhood dream job growing up? BBP: And it’s served you well! What were you like as a kid at age five? Did you have a knack for the arts back then as well? SK: Yes, in some shape or form I would say that I was a very inventive kid creatively whether I was drawing and sculpting, playing imaginary games and scenarios, playing instruments, or romping outside in the dirt. I was not the little girl brushing her dolly’s hair; I couldn’t sit still long enough for that! BBP: What do you like the most about collaborating with BoomBoom Prints? Do you like seeing your designs take new forms through color? SK: I love the ability to customize the colors of the designs through BoomBoom Prints. Since most of my work is screen printed in editions, I am not able to re-work the colors as much – it is one of my favorite features and a big driver behind me jumping on board. Being able to color match to nurseries and kid’s rooms is a great feature! 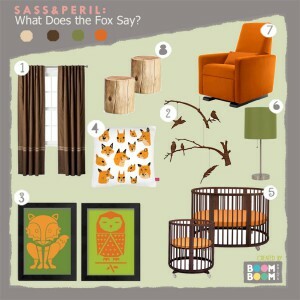 BBP: Did you put lots of thought into the colors and overall look of your room as a kid? What did your room look like growing up? SK: I recall lots of art and tear outs from magazines littering the walls. I also remember vivid paint colors; whether it was an accent wall or the whole room (thanks Mom!). I’m sure it was a mess, but these days I am very clean and tidy. BBP: Any other fun facts you’d like to add – maybe a few shout outs? SK: I’m a basketball nerd! Go Clippers! 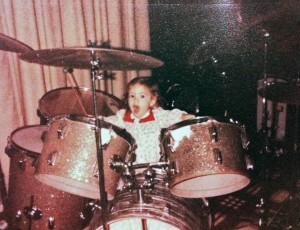 Oh, and Shannon was kind enough to share a childhood photo of hers- We never knew she was a musician, too!